Detects Police cars (marked and unmarked), Police vans, Police motorcycles, ambulances and fire engines. Using TETRA (Terrestrial Trunked Radio) technology, the Blu Eye alerts the driver there is an emergency vehicle in the area such as Police cars, Police vans, Police bikes, fire engines, ambulances, etc. This is thanks to fact that all emergency/Police vehicles in the UK use TETRA radios as standard. 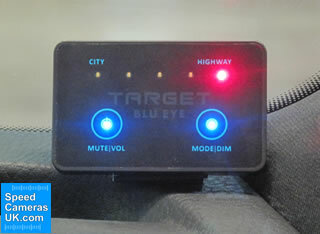 The Target Blu Eye will also warn to both marked and unmarked Police vehicles. Pictured above: Target Blu Eye control display panel delivers clear alerts in your vehicle. ‣Highway mode has the longest detection range which is ideal when travelling at high speed on a motorway for example. ‣City mode reduces the range of detection and is recommended for use of the Target Blu Eye in urban areas. The maximum range is approximately 1 kilometre. Coverage is variable and cannot be guaranteed and may be regional. The Target Blu Eye does not tell you when there is a TETRA Radio used for civil purposes. because emergency services use a different frequency. The detection range of the Target Blu Eye varies from hundreds of metres to approximately one kilometre. You can select different sensitivity modes. The environment can affect the range too (ie. In a city such as London buildings may shorten the length). The type and location of the antenna used also affects the range of detection of emergency vehicles. It is worth noting that that emergency services do not always transmit signals for the Target Blu Eye to detect. The TETRA Radio inside emergency vehicles can be switched off or be in direct mode (DMO). This will mean you will not detect the approaching emergency services in these situations. 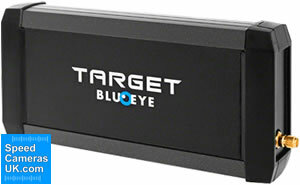 The Target Blu Eye system has a 2 year warranty. 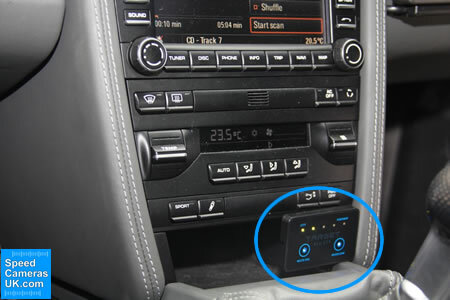 The Target Blu Eye is not a plug and play device, but instead requires professional installation into your vehicle - enabling the unit to be hardwired. We therefore recommend you use the services of a qualified automotive electrian/your local garage to carry out the installation. 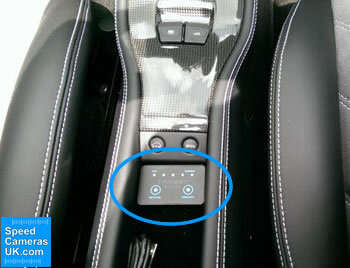 In total there are three parts to install which are the antenna, central unit and the control display unit. The most important part of the installation process is to mount the provided Antenna in a place inside the vehicle where it is fairly high-up within your vehicle. You could mount the antenna behind the rear view mirror out of sight of the driver. You may also choose to mount the antenna on the roof of your vehicle. You cannot locate the standard antenna in these locations: Under or behind the dashboard, in the engine compartment or behind the bumper. If there is too much 'electrical noise' this will mean you cannot install the Target Blu Eye effectively in your vehicle. The standard antenna will work with vehicles with heated windshields or heat insulting glass. The main central unit should be mounted in the boot if the antenna is mounted in the back of the car. If you locate the antenna in the front of the vehicle, you should mount the main unit nearby such as under the dashboard. The control display unit should be located in a visible location for the driver to easily access. It is important that the shielded 5 metre cable between the central unit and the display MUST NOT be cut, shortened or extended. You can choose to mount the display unit in the rear view mirror which allows for a discrete neat installation. The Target Blu Eye is very slim and can be mounted horizontally on the dashboard whereby the LEDs reflect on to your windscreen and will be visible to the driver. Pictured above: Blu Eye control display panel located low down on vehicles central console. Pictured above: Target Blu Eye control display panel fitted inbetween front seats. Target Blu Eye - What's in the box? 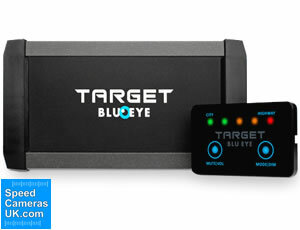 Looking for more information on the features of the Target Blu Eye or how it installs in your vehicle, etc? View the Target Blu Eye manual by clicking the PDF logo below. The user and installation manual opens in PDF format.